HIGH The first two-thirds of the campaign are outstanding. LOW The endgame is excruciatingly awful. WTF Why is there never a map function? It’s difficult not only to start a campaign well, but to start one perfectly. Establishing the proper context, setting just the right tone and hopelessly hooking a player is no easy feat. I’ve been through countless titles that haven’t managed it, but apparently it’s even trickier to end a campaign. …And then not only did it take a bizarre hard left in the endgame that it never recovered from, its performance only got worse and worse as time went on. But, first things first. 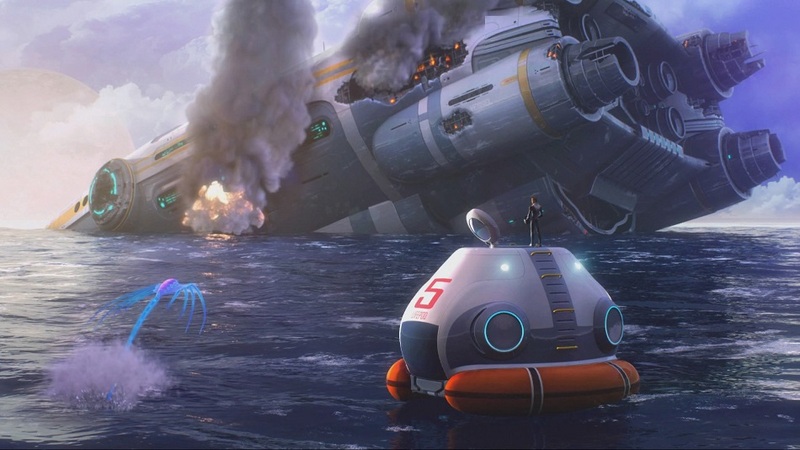 Subnautica begins with the player in an escape pod jettisoned from a spaceship about to crash on a water world. Once the pod is safely bobbing on the alien ocean, an AI explains that it contains everything needed for survival. Most crucially, it houses a fabrication machine that comes pre-loaded with blueprints for things that can keep humans alive. 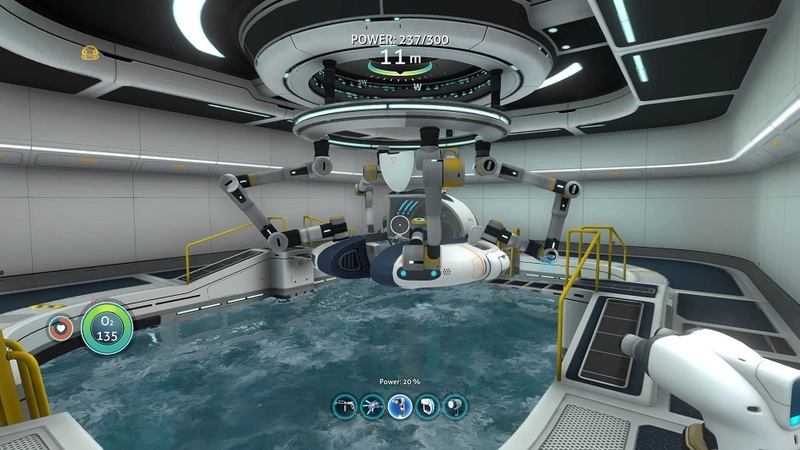 All the player needs to do is scavenge for raw materials, feed the machine, keep it producing necessary gear – survival knife, swim fins, a flashlight — and wait for rescue. Honestly, this opening is bloody brilliant. It frames the action, gives the player context, and has sensible explanations for all of the mechanics to follow. Of course an escape pod would have technology of this kind, it’s exactly what one would need, and of course the player would have to scavenge for materials – it’s all perfectly logical. The devs clearly gave a lot of thought to establishing a world and a premise that justifies the mechanics of play, and it succeeds wildly. Of course, mechanics can only carry an experience so far, but Subnautica has superb design for miles. Diving underwater to search and explore is fantastic — the seas are clear, the colors are vibrant, and the varied aquatic biomes require little suspension of disbelief. From the starting shallows to the darkest depths, it all feels natural, convincing, and thoroughly realized. The game also easily manages the emotional swing between peaceful seaweed gathering in a sun-dappled bay and the pant-wetting horror of being chased by abominations in the depths. It wasn’t long before I was utterly engrossed in finding pieces of wreckage, combing caves for ore and gems, repurposing flora and fauna, and happily counting the days since my virtual stranding began. 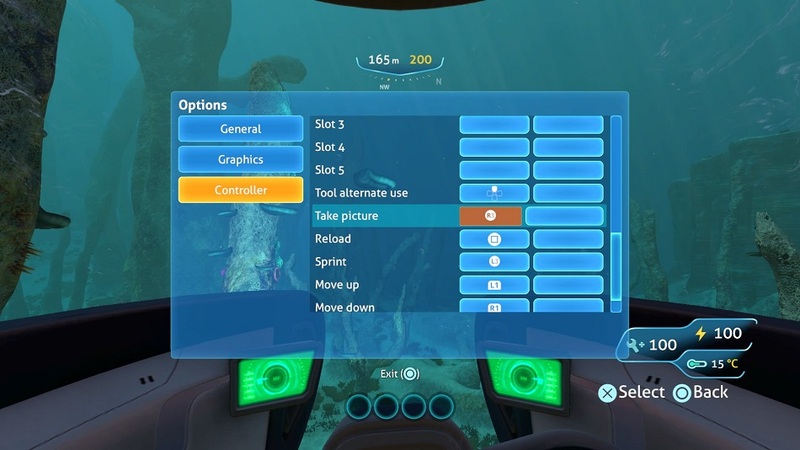 Another area that Subnautica nails is that the things the player builds come at a good pace and the majority of them feel worthwhile and significant. 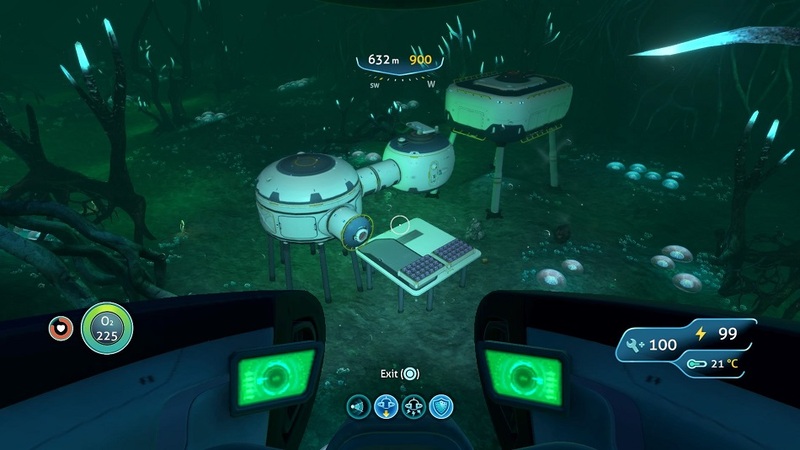 Finally building my first mini-sub was a triumphant moment, and taking time to create a small undersea habitat not only bestowed several gameplay advantages, but also gave me a great sense of pride and accomplishment – it was a tangible marker of reaching a point where I wasn’t just surviving, but thriving. Unfortunately, two significant things crop up that hold this otherwise-outstanding experience back — poor technical performance and some late-game roadblocks that are extremely disrespectful of a player’s time. 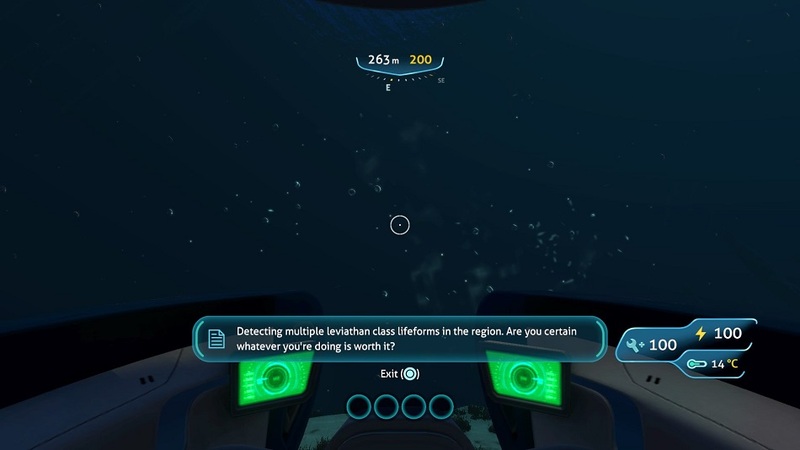 When Subnautica enters the final leg of the adventure, a few specific things must be located without any idea of where they are. Perhaps some got lucky and stumbled across them while exploring, but I had no clue. I spent much time blindly trying to find them, and eventually frustration eroded my desire to be self-reliant. I had to turn to YouTube in order to keep going, and to me, that’s something players should never feel forced to do. If the devs had added more pointers about where required things were and streamlined the endgame, the campaign wouldn’t come to a screeching halt the way it does. The lion’s share of the experience is fairly self-guided and moves organically forward, so I’m baffled why they slammed the brakes when they should have gunned the engine. Related, I was stunned that at no point does a map function become available. It’s tough to know which areas have been explored and which haven’t despite a number of visually-distinct biomes, and frankly, it’s a little absurd. I can understand not having a map available at the start when sheer survival is paramount, but by the time the player’s constructing deep-sea mechsuits and nuclear reactors, there’s still no way to map the terrain? Even having a rough idea of where to find new locations would go a long way towards fixing things. 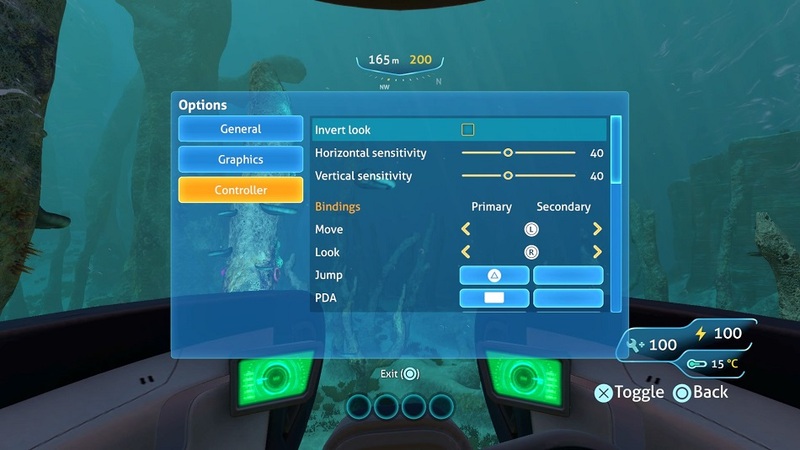 Now, about the technical performance – while Subnautica ran fine for most of the campaign apart from a few framerate hiccups here and there, the pop-in that cropped up near the end was a serious problem. When in shallows or in wide-open spaces, it’s largely absent. When in deeper areas or inside caves, the game would regularly fail to draw the environment but would still let me move ahead. It was easy to assume that nothing but open water lay in front of me, and then structures would suddenly appear in my face and I’d get disoriented — or worse, I’d get trapped inside geometry as it was filled in. I lost a large amount of progress on two separate occasions, and had constant instances of minor pop-in interference. Disclosures: This game is developed and published by Unknown Worlds Entertainment. It is currently available on PS4, XBO and PC. This copy of the game was obtained via publisher and reviewed on the PS4. Approximately 43 hours of play were devoted to the ‘freedom’ mode, and approximately 2 hours were spent in ‘creative’ mode. The game was completed. There are no multiplayer modes. Parents: According to the ESRB, this game is rated E10+ and contains Fantasy Violence and Mild Language. The official ESRB description is as follows: This is an adventure game in which players assume the role of a survivor on an aquatic alien planet. 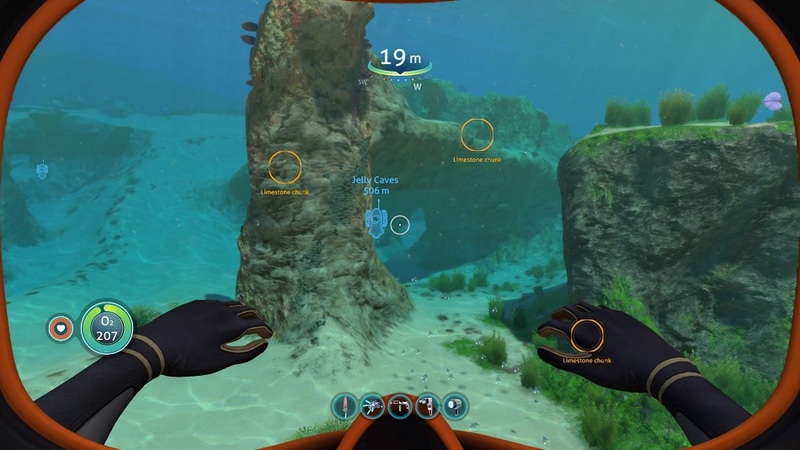 From a first-person perspective, players explore an open-world environment, search for resources, and interact with the planet’s aquatic wildlife and alien species. Some species may be hostile and can attack players and their submersibles. Players can ward off attacks by using knives and torpedoes. The words “damn” and “hell” appear in the game. Deaf & Hard of Hearing Gamers: Subtitles are provided for instances when the AI talks or shares information, but there are no subtitles or visual cues for sounds underwater – the roars or growls of nearby monsters will go unnoticed, so players who aren’t able to hear them may find themselves at higher risk of being attacked. Subtitle size is not able to be changed, but text display speed can be sped up or slowed down.